Caribbean rum punch with pineapple and orange juice is a festive island spirit made with tropical fruit - the ideal refreshment for a hot summer day. This welcoming Caribbean island spirit is often served freely at parties and large celebrations across the islands. The Caribbean islands are known for serving an enticing variety of rum punch with refreshing tropical fruit. Classic rum punch includes a collection of cocktails from various islands such as the Bajan rum punch, a Barbadian beverage; the well-known Planter's rum punch, a versatile cocktail mix of rum, pineapple and orange juice; and Caribbean rum punch with pineapple and orange juice, a contemporary version of traditional Planter's rum punch. Moreover, any of the tropical rum cocktails with fruit juice make a refreshing rum punch; just add a sparkling mixer like soda, wine or champagne and you have yourself an island party punch. Why not try one of these festive punches made with rum, pineapple and orange juice? An enticing bowl of Caribbean island spirits is a crowd-pleaser at any party or gathering. This traditional rum punch, with a twist of pina colada mix, serves approximately thirty-two guests. Fit an ice block or ring into an 8-quart punch bowl. Mix the ingredients in the punch bowl, except for the spring water and fruit garnish. Stir well. Add grenadine for taste and color. Chill the punch bowl in a cooler. Store any leftover punch in glass pitchers and chill. Garnish the island party punch with fresh fruit like pineapple and orange slices; or a combination of seasonal fruit. Garnish the area around the punch bowl with fresh tropical flowers. When you are ready to serve the punch add the spring water, and stir. A traditional blend of Caribbean rum punch made with rum, banana liqueur, pineapple and orange juice. Recipe makes one pitcher of punch. Add two scoops of crushed ice to a cocktail shaker. First pour the rum and liqueur into the shaker and stir; then add the juices, simple sugar and cocktail bitters (optional). Mix ingredients in shaker, strain and pour into a 1-quart pitcher; serves 4 guests. Garnish with nutmeg. 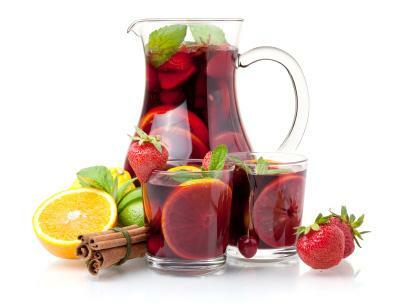 A tropical blend of white wine sangria made with three types of rum, brandy and fruity wine all make this sangria punch an island party favorite. Serve this refreshment in several pitchers, or a big punch bowl. Add all the ingredients into a 4-quart punch bowl or into 3 to 4 glass pitchers, except for the ginger ale and mint leaves. Stir well. Chill for 12 hours. Stir in the ginger ale just before serving. Garnish with fresh mint leaves. This punch serves approximately 16 people. Planters punch, a Caribbean cocktail, is easily turned into a party punch by simply multiplying the ingredients by the number of estimated servings. Adding club soda will help this tropical libation sparkle, plus add extra volume for a party punch. Recipe makes approximately two pitchers of rum punch. Place an ice ring in a 2-quart punch bowl. Combine all the ingredients, except for the club soda and fruit garnish. Stir well. Chill the punch bowl; store and chill any leftovers. If not using a punch bowl, fill 2 to 3 glass pitchers with the punch, and chill. Garnish the punch with orange slices and maraschino cherries. Add the club soda when you are ready to serve; this recipe serves 8 people. In the Caribbean, the way rum punch is served depends on how many guests are attending. Oftentimes the island punch is a complimentary beverage served at big events and island festivities. Rum punch is presented in Collin glasses garnished with tropical umbrellas, in pitchers with fresh fruit and wine glasses, or in huge punch bowls garnished with flowers, fresh fruit and punch glasses. A fun and tasty way to serve Caribbean rum punch with pineapple and orange juice is to hollow out a bunch of pineapples and coconuts and convert them into drinking vessels for your party. Garnish with fresh fruit and tropical umbrellas.